Popularly known as kook cords and leg ropes, surf leashes have been the lifesaving gear everyone has needed while surfing. Introduced in the 1970s, surf leashes are now an integral part of the holy trinity including the surfboard and the wetsuit. A surfboard leash helps one keep their feet placed on the surfboard when a big wave comes up and possess the threat to throw you off. Given their importance, one needs to be very careful while buying a surfboard leash. 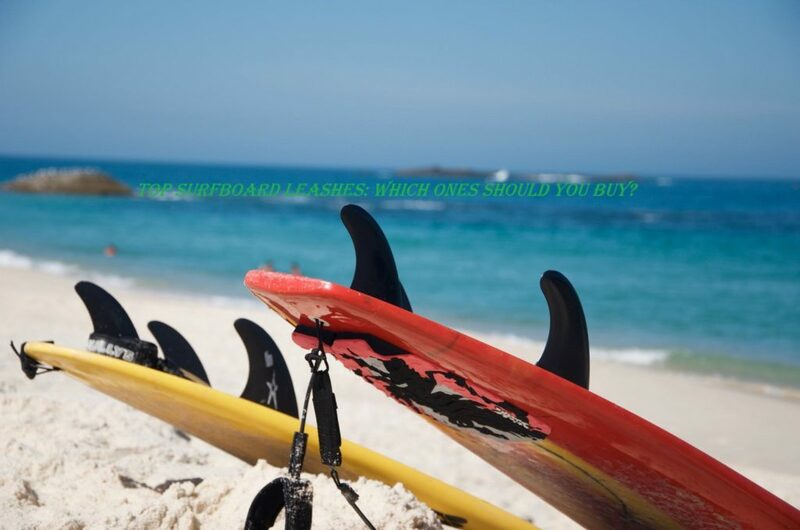 The most important factors to keep in mind while buying a surfboard leash include the length of the cord, its thickness, the quality of the connection between the cord and the strap, and how secure is the strap itself. The type of surfboard leach you buy is also dependent upon the wave that you must be riding. Wondering what’s your best bet when it comes to a surfboard leash? Here are some of the top surfboard leashes’ reviews to make your search for one easier. A surfboard leash must be bought based on its size and thus, BPS Storm Surfboard and SUP lease makes quite the cut as it’s available in 6 sizes ranging from 5 to 10 feet. The cord of the leash is quite thick at 7.2 mm. It is made out of thermoplastic polyurethane, the same material as that used in the cord to swivel connector. The polyurethane is very sturdy in nature and wouldn’t let you slip even in the highest of the waves. The company also ensures the comfort of its users by providing the neoprene cuffs that avoid the blistering of the feet. The leash also comes with an adjustable strap that can fit the thinnest of feet regardless of the age of the surfer. Apart from that, the surfboard leash is quite inexpensive for the features it offers and is secure as well. The company also ensures the comfort of its users by providing the neoprene cuffs that avoid the blistering of the feet. The leash also comes with an adjustable strap that can fit the thinnest of feet regardless of the age of the surfer. Apart from that, the surfboard leash is quite inexpensive for the features it offers and is secure as well. The premium surf leash is marketed as the one which will provide the ultimate strength while still being light and flexible. The surfboard leash is essentially 7mm thick and thus, is good for both short and high waves. The leash is available in 4 sizes, ranging from 6 feet to 9 feet. However, the customers have found the leash to be more useful during the short waves. Many have reported that the clasp doesn’t work well in the high waves. The ankle cuff provided in the surfboard leash is very comfortable and padded, with a pocket for the key. The best part about the leash is not the excellent ankle straps but its one year warranty against defects and the promise of a full refund if the customer doesn’t like it. The SBS Leash String stand at 4 mm and are thicker than before to provide more strength. These string are designed to work with stand up paddleboards, longboards, shortboards, and inflatable paddle boards as well. The leash string is highly effective in what it does and is a popular product amongst the customers. The leash string allows the rail saver to rest on the tail and keeps the leg rope from dinging the board. It is also quite easy to tie to one’s paddleboard and comes in a pre-cut form to avoid any extra work. The maximum load it can take is placed at 550 lbs, whereas the customers have claimed it to be well working at 450 as well. However, the only complaint the users have had is with its slightly shorter length. Designed for surfboard ranges from 6 to 12 feet, the culprit surfboard leash is available in the widest range of all. The leash is quite economical for its price and has both the mechanisms offered in most the leashes of its kind. These include the dual stainless steel swivel system and triple-rail saver. The surf leash offers extra rigid cuffs so that the clasp does not get undone in the middle of the surf. The company has planned the product well by adding the extra Velcro to be used with the wetsuit. The customers have noted that the product can run for as many as 150 sessions without any issues in it. However, it isn’t sturdy enough to be used for big waves. Like most of the surfboard leashes, the Dakine leash too consists of triple wrap rail saver. However, instead of the stainless steel swivels, it offers the brass ones. It offers molded fittings with highly fitted ankle cuffs. The cuffs also consist of a key pocket to help the user. However, the customers have said that despite the good quality, the ankle cuff is a little too stiff for one to handle. All the surfboard leashes have at least one good factor going for them. However, when looking for a surfboard leash, you want one with a good length, helps you balance well, as well as keeps your feet sturdy in the water. The BPS Storm Surfboard seems to offer it all – not only does it provide both comfort and security on its leash, but also is quite inexpensive. The leash comes with a guaranteed for life designed and will help whenever you have an issue with it.